Want to know more about Highland Cows? Well, you’ve come to the right place! The Highland Cow, or ‘heilan coo’ as it is affectionately known is one of Scotland most iconic animals. With its flowing red coat and long pointed horns, Highland Cattle have long been a part of everyday life at Rothiemurchus. Highland cattle are Scotland’s oldest native breed and our long established fold of pedigree Highlanders spend all their lives grazing on the sweet pastures around the famed Rothiemurchus native forest. Our Highland Cattle date back to the 1920s and were first registered in the Highland Cattle Herd Book (a list of pedigrees) in 1947. This means we can trace the bloodlines of our Highland Cattle back over 60 years. The longest bloodline is ‘Marsili of Rothiemurchus’ with the current Marsili being the 203rd in her line! Thousands and thousands of cattle grazed in the hills and forests of Strathspey during the 18th century they were even taken up into the high Corries in the summer. They were looked after by herdsmen who stayed in temporary buildings in the hills called shielings while their relatives stayed at home and gathered the crops for the winter feed. The cattle were ‘driven’ along the old drove roads either to lower level farms to be fattened for market or straight to the market, a few miles each day along drove roads through the mountains; Lairig Ghru was one, Lairig an Laoigh (Looee; Pass of Calves) another. Markets were held at places like Falkirk, Crieff & Carlisle and buyers came from England to pay good prices for high quality ‘Scotch runts’. (Highland cattle were smaller). At one market in the early 1800s some £30,000 changed hands, a fortune by today’s standards. Some drovers had a silver button sewn on their coat to pay for treatment if they fell ill (or a funeral if totally out of luck!) Cattle thieving was common and individuals could apply for a commission to set up an official Watch, which farmers would pay to retrieve stolen stock. Rob Roy MacGregor operated a Watch and was also a cattle dealer and drover. 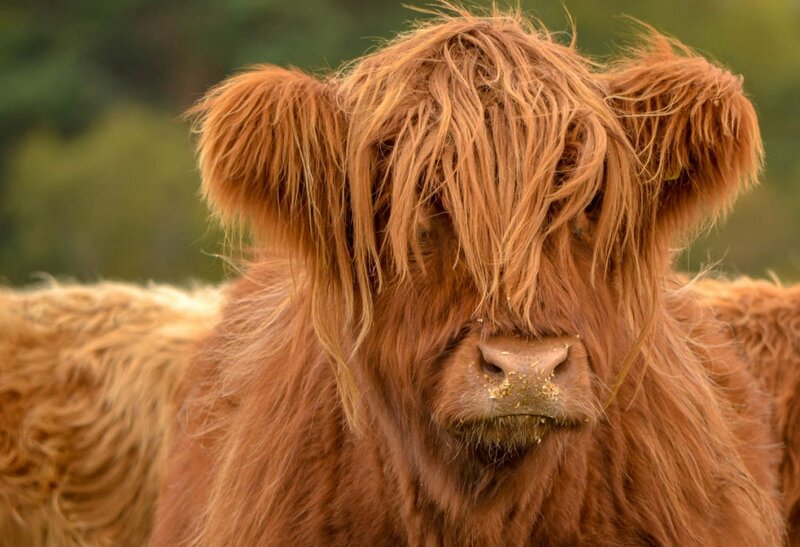 While Highland Cows today are famous for their distinctive red coats, they were once predominately black. Queen Victoria is said to have commented on a trip to the Highlands that she preferred the red coloured cattle and in an effort to please the Queen, this resulted in selective breeding of the reddish colour that we see most often today and the black colour gradually declining over time. While most cattle are referred to as a ‘herd’, Highland Cattle are actually known as a ‘fold’. Unlike most other breeds they are incredibly tolerant of very low temperatures, our Highland Cattle live outside year round. Poor forage and extreme weather is not a problem for these hardy animals who thrive in such conditions. They have an unusual double coat of hair, the outer coat, which is the longest of any cattle breed is made up of oily hair which covers a downy undercoat. Highland Cattle take a year longer than other breeds to mature and have very small frames, although not that small – Bulls can weigh up to 800 kilograms and cows up to 500 kilograms! Their meat has been scientifically proven to be lower in fat and cholesterol and higher in protein and iron then other beef and their small size mean there are only limited quantities of each cut. Highland Cows make excellent mothers and can give birth to up to 15 calves over their lifespan! 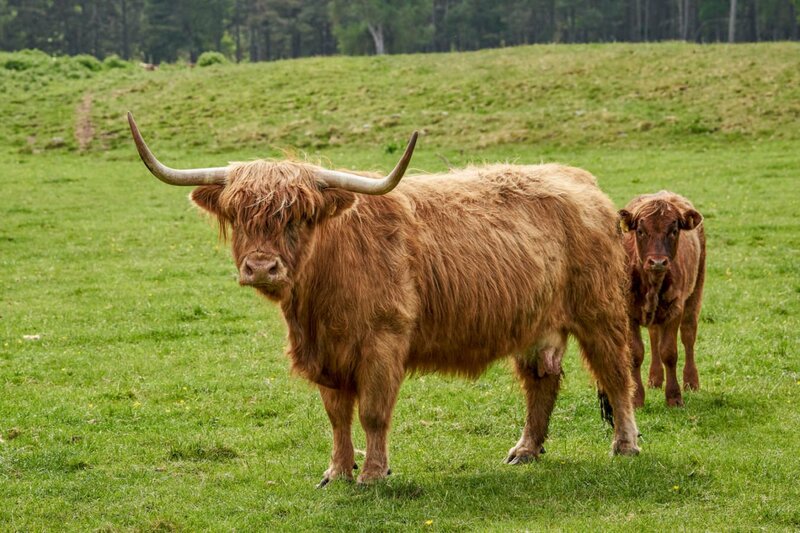 Generally speaking, you can tell whether a Highlander is male or female by their horns, with the bull’s horns going forward and the cows going straight up – a useful piece of knowledge if stuck in a sticky situation and wondering which direction to run! Where can I see a Highland Cow? You may be lucky enough to spot Highland Cattle on your travels, they are a common sight in Highland fields! 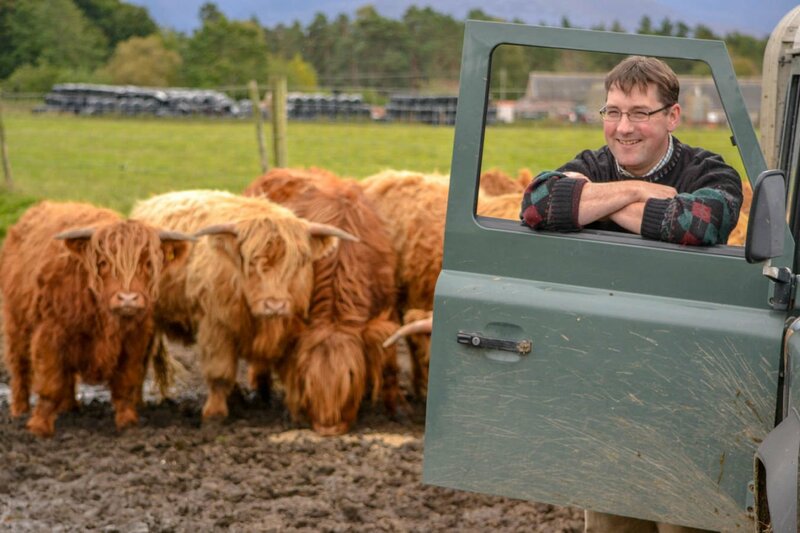 For a guaranteed sighting why not join one of our knowledgeable Countryside Rangers on a Hairy Coo Safari or Land Rover Experience! On the Hairy Coo Safari you’ll walk down to the farm to meet our wonderful hairy heilan coos. The Ranger ‘calls’ the Highland Cattle who come right up to the fence to be fed, providing you with some fantastic photo opportunities! Our knowledgeable Rangers have lots of great stories and information on Highland Cattle. Alternatively, climb aboard our long wheel based Land Rover and roam the tracks of Rothiemurchus on our Land Rover Experience. Guided and driven by an experienced Rothiemurchus Ranger sit back, relax and discover the many different aspects that make Rothiemurchus so special. You will be given an in-depth look at the history, wildlife and land use on Rothiemurchus. Favourite photographic stops include Loch an Eilein, the deer farm and of course our Highland cattle. For more information on our Ranger-led activities click here.